We spend hours in our car between the commute to work, running errands, and taking trips. When you are stuck in traffic, or just on the go, what better way to pass the time than listening to your tunes? At some point, you will likely want to upgrade your car’s sound system to make your listening experience more enjoyable. Buying a good subwoofer is a great way to start. Subwoofers typically come in three sizes-8 inches, 10 inches, and 12 inches. Subwoofers are known for pumping out a powerful bass. They also improve the car’s sound system in general by handling low-frequency sounds so that the car’s sound system can focus on what it is better at; the high- frequency sounds. Sometimes you may have little space to install a subwoofer into your car. Or maybe you just don’t want to use a lot of space to install a subwoofer. This is where shallow mount subwoofers come into play since they take up less space in the car. 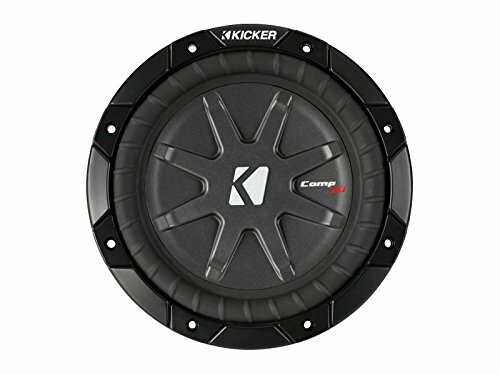 Below are some of the best shallow mount subwoofers. For over 70 years, Pioneer has been in the business of producing speakers and other electronics. A word leader in electronics, Pioneer has been involved in many innovations such as the car CD player, GPS car navigation, DVD player. 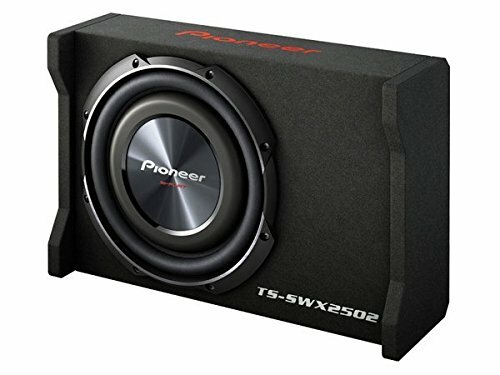 The Pioneer TS-SWX2502 subwoofer has a frequency response of 20 Hz to 125 Hz and sensitivity of 89 dB. It features an over-sized cone which moves more air, producing a loud, deep bass sound. The cone is made of MICA injection-molded resin which makes it very durable. Most traditional subwoofer terminals are mounted vertically or horizontally which makes you have to bend the wires to fit. This Pioneer subwoofer, however, features angled push terminals to make connecting wires easier. The enclosure is fully carpeted which makes the surface scratch resistant. JBL supplies their products to music professionals, concert venues, and stadiums all around the world. They have a rich heritage in the field of audio. The polypropylene cone of the JBL GT804 8-inch Reduced Depth Subwoofer is surrounded by a rubber edge which helps the cone keep its shape and produces a better bass tone and also makes it more durable. This 4-ohm subwoofer has a frequency response of 30-400 Hz, sensitivity of 91 dB, and a peak watt power of 800. It weighs 10.3 pounds and measures 10 inches by 10 inches by 10 inches. Since 1961, KENWOOD USA has been manufacturing quality products. They have invented many new technologies, such as polypropylene cones. Others companies have since copied their technologies. 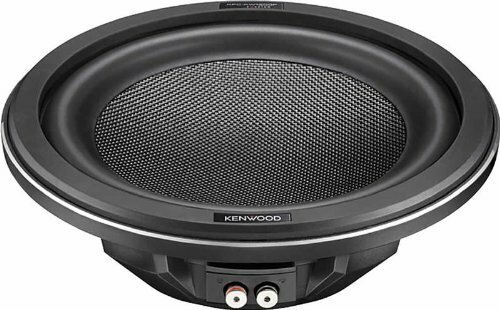 The Kenwood Excelon KFC-XW1200F 12-inch Subwoofer has a peak power of a whopping 1400 watts. It has a frequency response of 30 Hz to 700 Hz, impedance rating of 4 ohms, and sensitivity of 91 dB. It has a power range of 50-350 watts RMS. The cone is made of carbon glass fiber with butyl rubber surround. The basket is made of aluminum die cast. For over 35 years Rockford Fosgate has been making products that make listening to music even more enjoyable. They make products for boats, cars, and recreational vehicles. 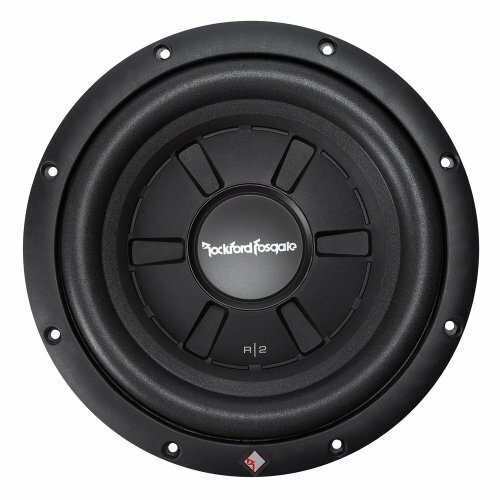 The Rockford Fosgate R2 Ultra Shallow 10-inch subwoofer features a Stamp Cast basket with integrated spider venting, and a mica injected polypropylene cone. The anodized aluminum voice coil former is superior to the traditional plastic substitutions. The aluminum quickly dissipates heat which keeps the subwoofer cool. Plastic does not have this ability like aluminum. As far as power goes, it produces 200 watts RMS and 400 watts max. This shallow subwoofer also features a linear spider with stitched 16 AWG tinsel leads. The stitched tinsel leads reduce fatigue and possible shorting. Since 1973, KICKER has been making top-quality products that maximize your listening experience. The Kicker 40CWRT82 8-inch Subwoofer is no exception. This shallow subwoofer is just 4.5 inches deep. It rises above many other subwoofers in that it is also weatherproof. This makes it great for ATV, UTV, and boat use. With a large diameter motor structure and a progressive-roll spider, this subwoofer has increased linearity and low distortion. It has a bumped top plate and an inverted bumped back plate. These features together allow for full voice-coil clearance and excursion. The result is a powerful deep bass. It has an RMS wattage of 300 and max wattage of 600. Investing in a great subwoofer is a great way to upgrade your car’s sound system. You will really feel the bass in your car and the sound system will perform better in general. The above list will help you to decide on the best shallow subwoofer to meet your needs. Subwoofers require an amplifier so you will need to purchase that as well. It is crucial that you install this equipment correctly. You can either have a professional do it for you, or you can learn to do it yourself. Below is a detailed video of how to wire a subwoofer and an amplifier into your car.